The BJP which has been facing widespread protests over its stand on the Citizenship (Amendment Bill) recorded a thumping win in the Sonowal Kachari Autonomous Council (SKAC) elections by winning 20 of the 26 seats. The Congress came a distant second bagging just five seats while one seat went to an independent candidate. The AGP which till recently was an ally of the BJP before parting ways with the saffron party drew a blank. For the BJP it was a much needed victory as the party recaptured the Council after facing widespread protests from citizens across the state on a daily basis over its support to the Citizenship Bill. Out of the 11 seats in chief minister Sarbananda Sonowal‘s home district Dibrugarh, the BJP emerged winner in as many as nine seats while the Congress and Independent bagged one seat each. The BJP winners in Dibrugarh district are present SKAC chief executive councillor (CEC) Dipuranjan Makrari (Khowang), Badan Sonowal (Kutuha), Rishikesh Saikia (Mancotta), Madan Hazarika (Lepetkata), Duleswari Bora (Sohorikota), Biswajit Sonowal (Naharkatia), Ridip Hazarika (Kheremia), Dipak Sonowal (Rongsongi) and Anamika Borsaikia (Tengakhat). Congress candidate Ritamoni Hazarika won from Kamargaon while independent candidate Ramoni Hazarika won the Kutuha seat. As many as 450 villages with a total population of 3.3 lakh fall within the jurisdiction of the Sonowal Kachari Autonomous Council spread over the seven upper Assam districts–Dibrugarh, Tinsukia, Sivasagar, Jorhat, Golaghat, Dhemaji and Lakhimpur. In the last council election held in September 2013, the Congress had won 14 out of the 26 seats, followed by the BJP 10 seats and two by independents. However, in July 2016, three Congress members and the two independents joined the saffron party paving the way for the BJP to rule the Council. 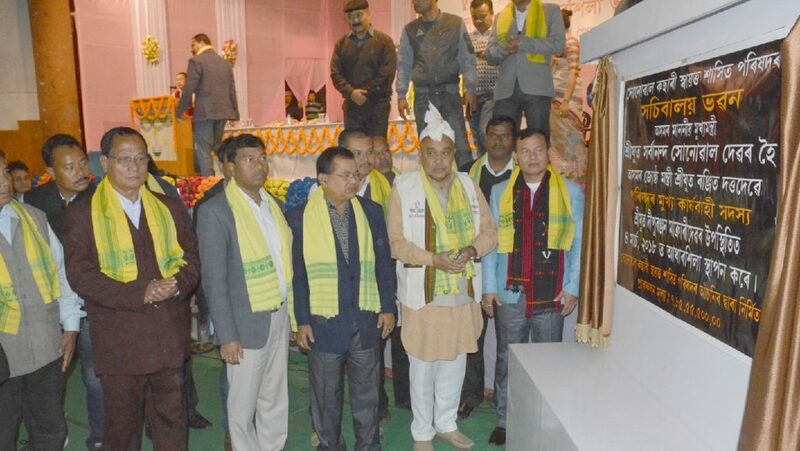 The 5-year term of Sonowal Kachari Autonomous Council was completed on October 29, 2018.